As we’ve discussed throughout the semester, design is not just about making things pretty, but also functional–to go back to my former classmate’s telling, the crossroads of art and engineering. This week’s web visits focused more on the functionality part, specifically making websites accessible to people with disabilities, and the reading (Edward Tufte’s Visual Explanations) on making information and arguments accessible in visual form. As I’ve worked on my website and blog, I haven’t been as cognizant of accessibility for people with disabilities as I should have. Dr. Petrik has alluded to methods that she uses on her own sites for screen readers. Although I could have just plucked her code, I had not yet done so. I also sometimes have put in alt-text for my images, and admittedly barely so. After using WebAim’s Screen Reader Simulation, I’m going back and making sure that my pages are more accessible, particularly to visually impaired people. If you haven’t used it, I strongly recommend you do so. Maggie makes the point that, at its base, the Internet is a fundamentally text-based medium–even when it comes to images. This makes it more accessible, and shows that the main thing is conveying information. Now I see another reason for Steve Jobs to take on on his seemingly now-successful crusade to destroy Flash: it does not help to convey information for those unable to see it, because it obscures text from screen readers. This does not mean, of course, that images do not have their place. This is where Edward Tufte’s Visual Explanations comes into play. Sometimes a visual simply makes an argument better–as long as it is done correctly. Lindsey’s post has a great synopsis of some of the book’s more salient points. 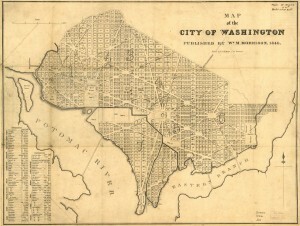 Map of Washington, 1846. Map shows the squares and streets of the city, but not where the actual buildings are--perhaps giving the impression of much more urban development than in actuality. How a visualization is done, of course, makes a difference in what information it conveys. 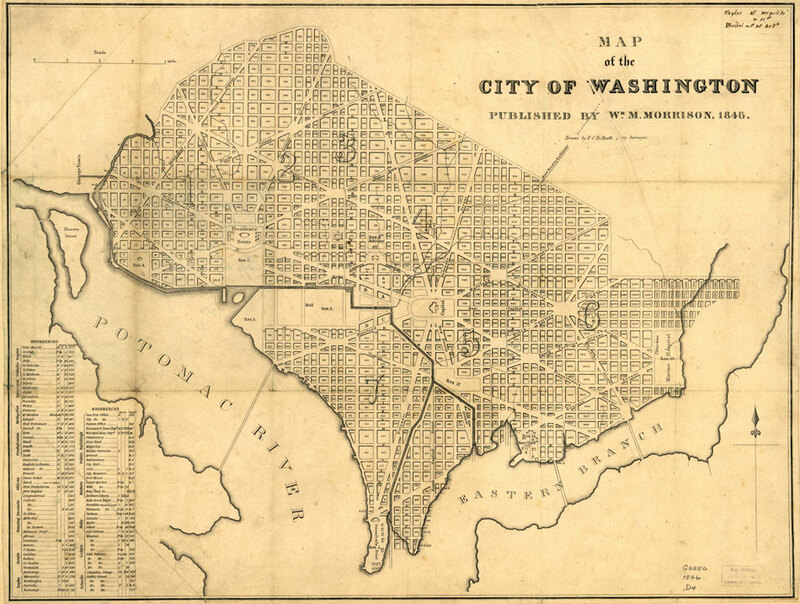 To complement Tufte’s brilliant examples, I’d like to add early maps of Washington. Often we see the original L’Enfant-Ellicott plan of streets. 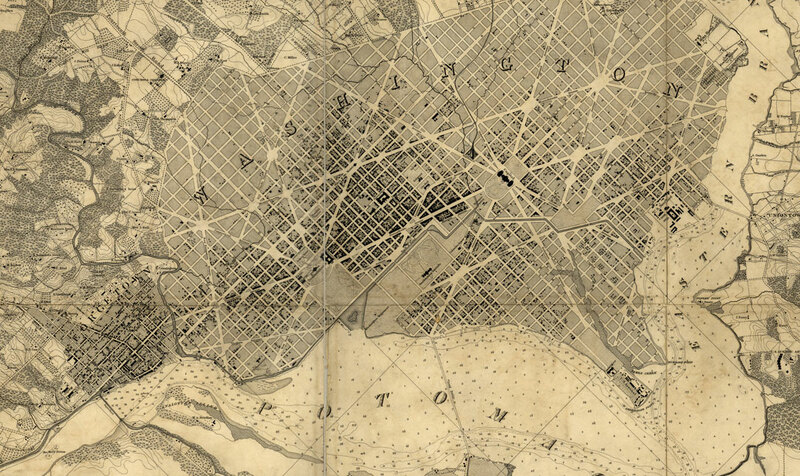 Later maps of Washington show the same, such as the 1846 map that I show here. But then consider the Boschke map, produced just before the Civil War (and confiscated upon war’s outbreak because of its possible value to the Confederacy). The mapmaker meticulously detailed each building in the city, not just the streets and squares as most previous maps did. This map shows just how undeveloped the planned area of the city of Washington was, seven decades after L’Enfant, Ellicott, and Banneker laid it out. The streets were there, but many blocks were undeveloped. One would not gain that impression from the 1846 map. Boschke map of Washington, 1857, showing where the buildings are. A close look reveals most development concentrated around the Capitol, White House, and 7th Street--but most of the L'Enfant-Ellicott plan remained undeveloped. Along the lines of accessibility: not only are some arguments more accessible via images and visualizations, but some people learn better via images. I, for one, tend more to remember seeing a picture of something than a written or auditory explanation. The graphics in this book are absolutely stunning, and demonstrate–not just tell–how images can be used to convey meaning. By working in new media, we now have greater abilities to communicate with more than words. Our visualizations can reach all the more people. So, then, we have a juxtaposition here in this week’s readings. The Web allows us to communicate using not just text but also images, movies, sound files, etc. But at the same time, it makes our content more accessible to audiences that rely on the text. So, then, what to do? In the public history world, we design exhibitions and educational programs around different learning styles and different physical abilities. I remember many times walking a space with my exhibit designer former boss and measuring out accessibility requirements, and discussing different learning styles with educators. Just the same, in the digital world we must design to be accessible not just to people with physical impairments but different learning styles. So we must incorporate both greater explanatory text and explanatory images into our sites. The images are there for those who can see them; good descriptions help convey textually the messages we are trying to convey with the images. Is this hard? You bet. In public history, it is. But it is also necessary. It is in digital history, too. Thanks to this week’s assignments, I’m going to make a point to be more conscious of making my work and its arguments accessible–in all the many shades of that word–to various audiences. 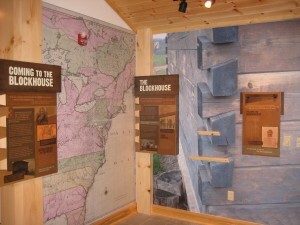 Map in the Wilderness Road Blockhouse Interpretive Center, blown up from a .jp2 file from the Library of Congress. Wound up crystal-clear. Instapaper: This app, for iPhone, iPad, and for web browsers, is wonderful for saving things that you want to read, but for which you don’t have time at that moment. I use it most often to save articles off of Twitter, particularly ones that I see during my commute. It’s also nice to have for said commute, or for time at the gym. In fact, last semester I read most of my articles in that way. Library of Congress Map Collections: The Library of Congress has one of the world’s most amazing map collections, and has digitized a bunch of it. Not only is it digitized, but with super-high-resolution, .jp2 files. Meaning: When I worked for the exhibition design firm, I downloaded a .jp2 version of a late 18th century map of Virginia (sadly I forget which, so I don’t have a link to it here), made some tinkers (Photoshop did not at the time read .jp2, something that has since been corrected), and blew it up to a 8.5 foot tall wall mural at the Wilderness Road Blockhouse Interpretive Center in far southwest Virginia. Amazingly, the map at that size is crystal-clear. I’ve also taken a neighborhood view from an 1884 birds-eye of Washington–I was able to get such detail because of the quality of the scan. And I previously wrote about how the serendipitous discovery of an 1819 map of Mexico and the southern United States led me to a person to include in my dissertation (alas, someone else has already written an article on him. Harumph.) Not only are these maps great for display, however; they also are wonderful primary sources. Something indispensable in any historian’s toolkit. David, I’m glad you mentioned the LOC ‘s mapping division as a tool. I’ve been culling through their items for maps appropriate to my final project and find their system of using MrSid and JPG2000 image compression rather frustrating. Good to know that I can use photoshop to help open and refine these items. After multiple unsuccessful attempts at downloading the suggested viewer programs from the LOC’s help page for these image compression programs, I was ready to rethink my technology budget and request other versions through the scan service OR break out the markers and construction paper as I did for Hist 696 to create my own maps. One lesson from this experience using large scaled maps is that the map navigator function at LOC is not very user-friendly. Balancing the constraints of download time and file size with functionality is an important consideration for database and archive developers. This lesson will also determine how I actually use these large map files as web content and the types of tools required for my viewers to have a successful viewing experience. David – when I saw accessibility, I started thinking about museums, too. Did you ever go through your exhibits in a wheelchair? It puts you at the height of a child and effects a very literal change of perspective. Thank you for the map collection link! I like maps, but get frustrated when I want to compare two of different dates which are different orientations, scales, and scopes. That is a good idea with accessibility, to go through in a wheelchair. Do I remember you once posting about that? I remember thinking it was rather insightful, so sticks out in my mind (kudos!). As for maps, you raise a good point. As I was reading more of the Tufte book this afternoon, I started to kick myself for the way I presented my maps for comparison. Mainly due to laziness I didn’t bother reorienting the Boschke map (which doesn’t face due north) to make it more comparable, and to put it together with the 1846 map. Then tonight I had to give a talk for work out in Montgomery County, so didn’t have a chance to make that change. Now doing an addendum… I showed Tufte’s point in my comparison! I liked how you integrated the maps into your blog post– with these and your conclusion in mind, I thought again about the hard reality [okay, that sounds dramatic but you’re right- it is a tough task] of conveying visual arguments into text. How do we convey an argument with textual clarity when it can be made with just a glance at a photo or image? I’m glad this week’s readings gave us an awareness of the importance of accessibility to the visually impaired audience, and I think it will be interesting to see how we solve these problems in the future. Also, Instapaper = sweet. This should help with decreasing the amount of windows I just keep open on my iphone for future reading sake.